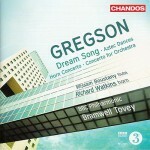 Immediately attractive, brilliant, wide-ranging and demanding much of the soloist, this is another of Gregson’s works which it is all too easy for listeners to imagine that they have grasped all it contains after one or two hearings. But beneath the glittering surface of much of his music there is an inner strength and compelling compositional drive which should not be overlooked. Aztec Dances … a fizzingly gripping chamber Flute Concerto … inspired by the British Museum’s splendid ‘Moctezuma: Aztec Ruler’ exhibition. Gregson … has succeeded in imagining himself – from a 500-year distance – into Aztec ritual.